Local directories is a huge task for most people. With the use of Cacidi Extreme and the auto pagination engine called “AutoCalc”, Extreme are able to layout hundreds or thousand of pages with a very limited manual efforts. This tutorial will show you what you can achieve with just a data file, a small prescript to manipulate some of the data structure of the data, a templates and Cacidi Extreme. This directory contains a list of owners of classic cars with all there contact information but also a list of the cars they own , which year, model, type and which kind of state they are in. The sur- and first name should be in bold, and address, zip, city and email i regular, this information should end with a tab and the phone number. 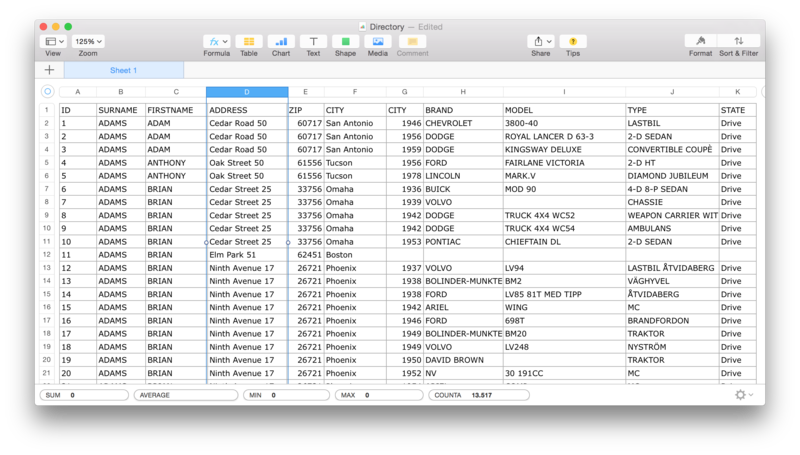 After the owner information a list of all the vehicles with production year, brand, model, type and state they are in. The first thing we will do is to take a look of the data. As you can se the data, in this case a tab separated file from Excel, has a list with the header name we will need to insert into the design to merge information data-to-design. For this tutorial we will be grouping data. Enter the Project Settings dialog box, by choosing the “Project Settings” in the palette popup menu. When then dialog box are open select the “New” in the “Select a Base Settings” popup menu. Enter Directory as the name when prompted. Now make sure you have selected “File” in the data source selector. Now use the “…” 3-dot button right to the “File Name” file path field. Select the “Directory.txt” and press the “Refresh” button to load the file. If the file is not loaded, it could be because the file is open in e.g. MS-Excel, in that case , close the file in Excel. 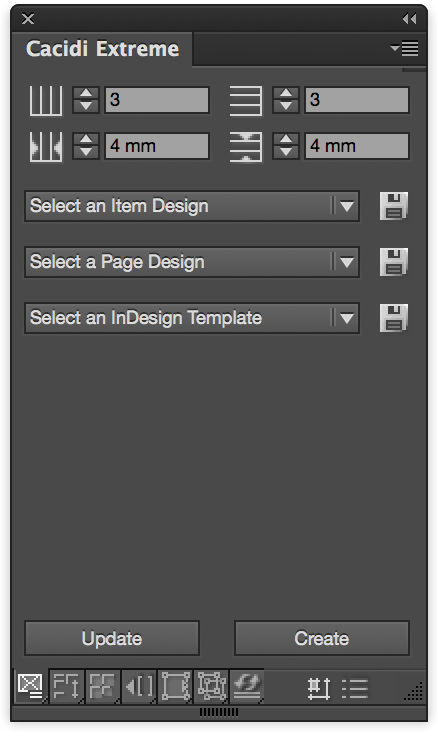 Now choose the right ID field, the folder for the Item Design, and the folder for InDesign templates. Each cars will be presentet on it own line. Save the project setting by exiting the project settings dialog box, by pressing the “OK” button. Start setting up the page grid, in this case there should be 2 columns and 1 row, the gutter should be 5mm both horisontal and versical. In the first column create a text frame covering the full tile. 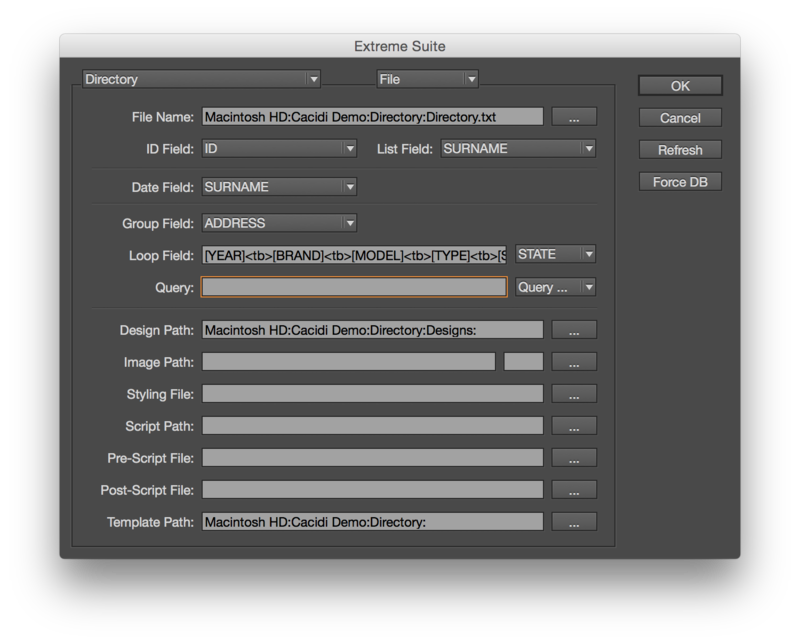 Insert your InDesign Text marker in the text frame, so that you are really to type in the frame. 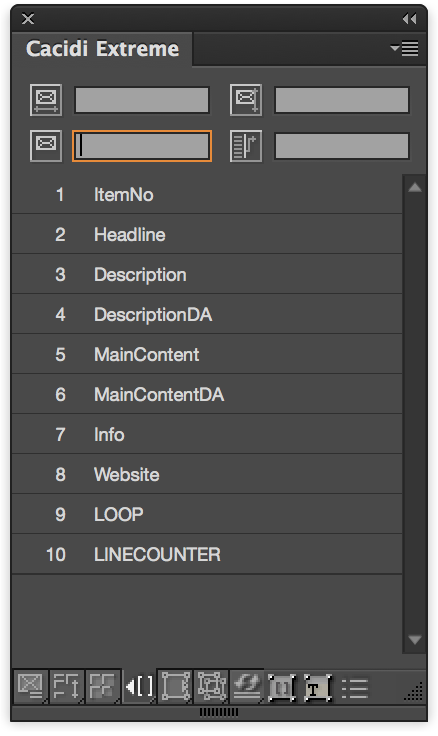 Make sure the design is selected in the popup menu, and the page grid is still 2 columns and 1 row, press the “Create” button. Let the production run a few seconds, the cancel the production by clicking the “Cancel” in the progress bar. If the design looks the way you want, continue with the “Prototype” AutoCalc, else go back to the Creating the design chapter. 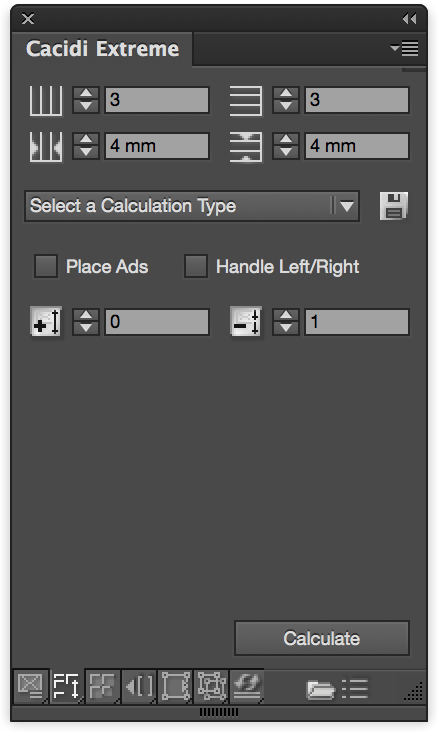 Select the calculation style you just saved in the “Select a Calculation Type” popup menu, the press the “Calculate”, and the production starts. All contents of the text frame with the design will be placed into the forth running text frame. Remember to wait until the full production is done for the pages to be produced. Enjoy! Do you do catalogues like the yellow pages?